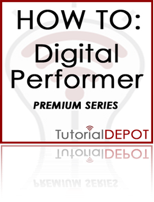 To view example videos from the HOW TO: Digital Performer-PREMIUM Series , click the name of the HOW TO from the list on the bottom left side of the TD-Player below. The HTDP PREMIUM series includes larger full length widescreen (16:9) 640x360 formatted movies. The PREMIUM HOW TOs cover from basic to advanced tips and techniques for getting the most out of your DP rig. The FREE HTDP TIPs are short segments from the full complete tutorials available here. If you'd enjoyed the TIPS, then you'll really find the PREMIUM tutorials take you to a new level. There are two option for getting the HTDP PREMIUM HOW TOs, PREMIUM Subscription and PREMIUM Bundles. The PREMIUM MEMBER Subscription provides 6 months of new HOW TOs delivered weekly via video podcast. The PREMIUM Bundles provide an option for you to purchase batches of 10 HOW TOs for download.